Lulu had been through eight homes in her first year of life, a sad circumstance for a dog. Fortunately she was about to get yet another chance when Ontario Bloodhound Rescue, in Simcoe, ON, took her in and listed her on Petfinder. Rebecca Hobers of Smithville, ON, wanted a dog and knew it had to be a rescued one. “My partner at the time loved hounds and grew up with them, so he steered me towards Lulu,” she says. It was a good hand on the wheel because Rebecca was a goner once she met Lulu. “Lulu has shown me love, compassion and most of all patience,” she adds. Of course, Rebecca needed to have patience, too, because at the beginning, Lulu had many insecurities and misbehaviors. But then, after one of the occasions when Rebecca felt like giving up and tearing out her hair, Lulu would turn her big brown eyes on Rebecca and all was forgiven. “Nothing can compare to that look,” Rebecca says. Two years after adopting Lulu, Rebecca decided fostering dogs would be a worthwhile endeavor. 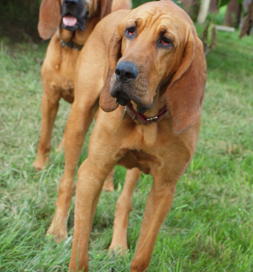 She contacted Ontario Bloodhound Rescue and began taking in bloodhounds. So far, she has helped 15 dogs who have subsequently found forever homes. She credits Lulu with teaching those dogs how to be dogs again, which helped them get adopted. She admits it is heart wrenching, both for her and Lulu, when the temporary family members do get adopted and leave for their new homes, but there is always another dog waiting for Lulu and Rebecca to take him or her in, and the good they are doing has its own emotional rewards. Lulu is eight years old now, and Rebecca doesn’t know how she ever got along without this loving pooch. Together they are making a difference in animal welfare.